We are here to satisfy your appetite if you are looking for fast, fresh pizza delivery in Pembroke Pines, Florida. Pizza Machine has been putting smiles on the faces of locals for well over two decades, and we are a family owned and operated business. This local connection is something that we take to heart, and we have built countless ongoing relationships with consistently satisfied customers. Our friendly drivers can quickly reach all parts of town, from the Route 27/Sheridan Street neighborhood to City Center and everywhere in between. The delivery pizza Pembroke Pines, Florida residents can order from us is really something special. We do not rely on expensive national advertising campaigns as we churn out lifeless food. As a truly local, family run restaurant, we do everything right, and this is why we have been able to maintain our position for over a quarter of a century. Our dough is carefully formulated, and people always notice the freshness of our sauce, because it is made with San Joaquin Valley tomatoes. The mozzarella cheese blend we use is of the highest quality, and our premium toppings put our pizzas over the top. Though the quality is unmistakable, we still have the ability to be at your door to deliver your piping hot pizza in a matter of minutes. Pizza Machine is the only logical choice for pizza delivery in Pembroke Pines, Florida. At the same time, you can also order from our extensive Italian food menu. We have a build your own pasta concept, and you can start off by choosing between spaghetti, fettuccine, or penne pasta. We should point out the fact that we import our pasta from Italy, and our sauces include meat sauce, tomato sauce, pesto and basil, alfredo, and garlic and oil. You can top it off with meatballs, sausage, sausage and peppers, mushrooms, broccoli, and/or spinach. Our dinner menu includes baked ziti, ravioli, stromboli, calzones, chicken parmesan, eggplant parmesan, and more. Plus, we are the go-to resource for Italian food catering in Pembroke Pines, Florida, so you can rely on us to provide the food for family gatherings, business luncheons, wedding receptions, baby showers, etc. 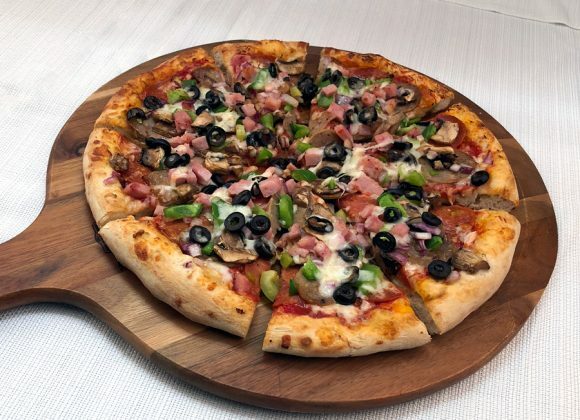 If you are ready to enjoy the best delivery pizza in Pembroke Pines, Florida you can place your order through this website or call us at 954-437-3333.